More than any other area of society, science is seen as the exclusive preserve of experts and professionals, not something the wider community is able to interact and engage with. Katherine Mathieson suggests it is time to challenge stereotypes in science; to support, grow and diversify the community of people who are interested and involved in it, and strengthen their influence over its direction and place in society. An initiative such as Run the Solar System, developed as part of British Science Week, is a great example of how this can done successfully. Science needs to be taken out of its cultural ghetto. Currently, it’s seen as the realm of professionals and experts. But other parts of society – business, politics, art, or sport – are perceived as being there for anyone to own and engage in. But how can we re-examine stereotypes in science? Like science, these parts of society have experts and professionals. Unlike science, they have a wider community that feels a sense of identity and ownership within them. These are the people who pick up their paintbrush, guitar or camera at a weekend, or simply enjoy a kickabout. They’re the people who vote in elections, bet on big sporting events or invest in stocks and shares. Generally, we don’t have these people in science. There are a growing number of exceptions – campaigners, pop-science fans – but science is still seen as “that thing that scientists do”. I recently spoke to someone with a PhD in physics, who worked as a physicist for 20 years but has now moved into what he calls “sociology”. Remarkably, he no longer considers himself a scientist. Imagine then the relationship a person without a science background may, or more likely, may not have with science. The result is that it’s undervalued in our culture. When it’s not something people feel a part of, science is overlooked in decision-making. Communities keep it at arm’s length and don’t feel like their voices will be heard, even when it directly affects them. Politicians and business leaders often push it to the side or leave it as a second thought. Society’s biggest challenges and opportunities – pandemics, climate change, cyber-security, food security, healthcare – are all-too-often seen as scientific issues, there to be debated and decided upon by scientists. The truth is that science belongs to a wider community. Each of these issues requires a partnership with the rest of society – whether that’s entrepreneurs, artists, civic leaders, nurses, farmers, policymakers, or the general public. At the British Science Association, we want to rebrand science. We want it to be seen by all people as something that is a fundamental and inclusive part of our society. Our mission is to support, grow and diversify the community of people who are interested and involved in it; and to strengthen their influence over its direction and place in society. We continually work with the public, government and business to develop campaigns and initiatives to help us achieve this goal. Our longest standing project is the British Science Festival, which has visited a different city across the country since 1831. The festival is completely free and encompasses science in the broadest sense to ensure there is something for everyone. From theatre performances to brewing our own festival beer, from firework displays to art installations, we show that science spreads through the fabric of society. We also organise British Science Week, a ten-day celebration of science, technology, engineering and maths (next scheduled to take place from 9-18 March 2018). This is more of a grassroots initiative, with events happening all over the UK. These are usually grant-funded and organised entirely by local communities, giving them complete ownership over science, delivering it to the people and communities they know the best. 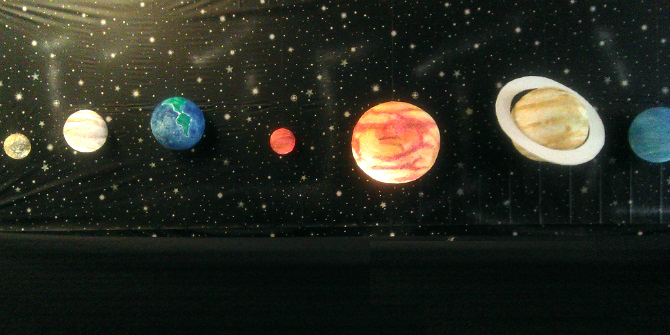 Image credit: The Solar System Planets by Melissa Adret. This work is licensed under a CC BY 2.0 license. As part of British Science Week, we developed an initiative called Run the Solar System. This is a virtual race from the Sun to Neptune via a free running app, where the solar system is scaled down to a 10km distance. The app tracks your position using GPS and as you reach the position of each planet, broadcaster and space enthusiast Dallas Campbell provides a beautiful narrative commentary about the planets, interspersed with original recordings from planetary missions. This was a hugely successful initiative, engaging a wonderful mixture of people from all corners of the globe, many of whom had never heard of or interacted with the British Science Association before. The success of Run the Solar System was down to tapping into something that people love – sport – and engaging them in a fun, relaxed way, sparking their imaginations and our human nature to explore and hear stories. Mixing the physical with the mental meant that astronomical distances of billions of miles, which can seem abstract and untouchable, were felt by the runners. You race past the first four planets in a couple of kilometres, but the distance between Saturn and Uranus is a full third of the 10km distance. Astronomical distances will never be looked at in the same way again by those who took part. This is the essence of what we want to achieve at the British Science Association. We want people to engage in science and feel a part of it, without fear or alienation. We want it to be fun and fascinating, to be something that people can feel ownership of. It affects all our lives in huge ways, impacting our health, wellbeing, families and the world we live in. We, as an entire global population, deserve to claim science as our own. This blog post originally appeared under the title “Challenging the stereotypes in science” in the November 2017 edition of Open Access Government magazine and is republished with permission. For more information about the British Science Association, please visit the BSA Blog. Katherine Mathieson is Chief Executive of the British Science Association. Thanks a lot for this blog post. Interestingly, the post states how “politics, art, or sport – are perceived as being there for anyone to own and engage in.” (I believe this statement is less true for business). One of the main characteristic of those three area is that they exist thanks to public interest and direct support: art needs audience, sport needs supporters and politics needs voters. What about science? The validation of the scientific results is built on peer-reviewed process, which makes scientific results robust but excludes “non-peers”. Would it be possible to foster the inclusion of people’s views in science, for example by having them design research questions to be investigated (with a dedicated research budget!)? By enabling constant dialogue between various audiences and communities and on-going research? By valuing public engagement in a researcher’s career? Many researchers are interested by Public Engagement but struggle with time as their first need is to publish and build their career on other achievements.